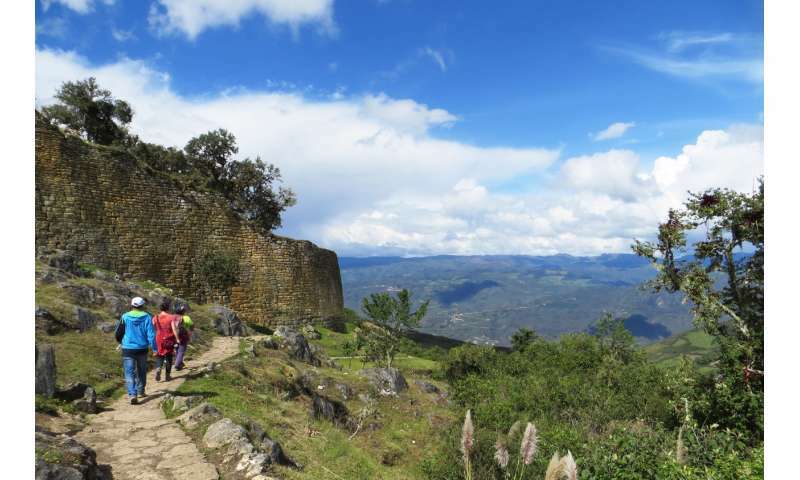 The Chachapoyas region was conquered by the Inca Empire in the late 15th century. Knowledge of the fate of the local population has been based largely on Inca oral histories, written down only decades later after the Spanish conquest. The Inca accounts claim that the native population was forcibly resettled out of Chachapoyas and dispersed across the Inca Empire. However, a new study in Scientific Reports, by an international team including researchers from the Max Planck Institute for the Science of Human History, uses genetic evidence to reveal that despite Inca conquest, the population of Chachapoyas has remained genetically distinct, and not assimilated with that of the Inca heartland. Despite their spectacular achievements, from the first cities of the Americas to the Inca Empire, the indigenous peoples of the Andes left no written histories. One legacy that can now be read, however, is the genetic diversity of their descendants today, especially when taken together with the rich archaeology of the Andes and the prehistory of its native languages. This is the approach taken in a new study in Scientific Reports to test the demographic legacy of the Incas. The study emerges out of a collaboration between research institutes in Peru and in Germany, including the Max Planck Institute for the Science of Human History. The focus is on a key region in the cloud-forest transition between the Andes and Amazonia in northern Peru. Here the Incas encountered fierce resistance from the "Warriors of the Clouds," the Chachapoyas culture, noted particularly for its distinctive body-shaped sarcophagi and the monumental fortress of Kuelap, the "Machu Picchu of the north." Particularly to punish and to secure control over such rebellious lands, the Incas are thought to have resettled millions of people across the "Four Quarters" of their empire, Tawantinsuyu. Chachapoyas was reportedly singled out for such treatment, making it an ideal case for using genetics to test the accuracy of Inca oral histories, which were not written down until almost a century later, by the Spanish conquistadors. Map of sampling locations and approximate distribution of sub-branches of the Quechua language family, as traditionally classified. Red dot 1 marks the sampling locations in the Amazonas region (Chachapoyas City, Luya, Huancas, Utcubamba South, La Jalca); red dot 2 marks that in the San Martín region (Lamas, Wayku neighbourhood). The inset zooms in on the sampling locations in Amazonas. Credit: Barbieri et al. 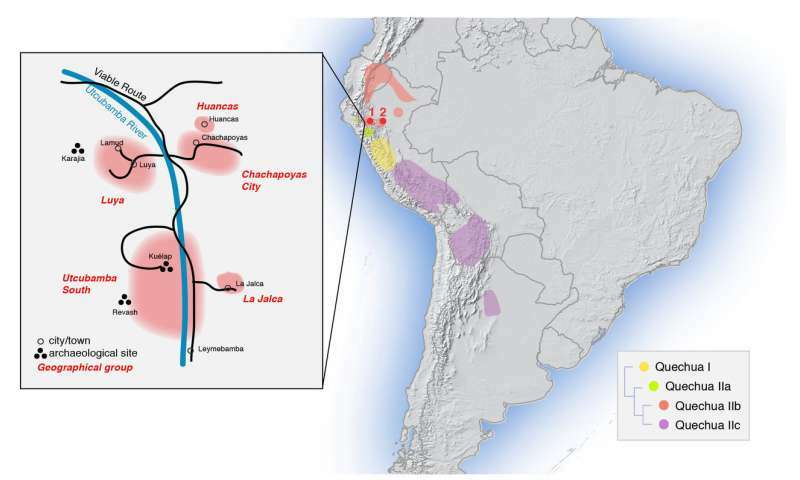 Enclaves of genetic diversity resisted Inca impacts on population history. Scientific Reports, DOI: 10.1038/s41598-017-17728-w.
"By targeting various linguistic indicators, we were able to pinpoint a genetic signal in Chachapoyas that turned out to be far more diverse than we expected, especially in the male line, from father to son," explains Chiara Barbieri, a geneticist at the Max Planck Institute for the Science of Human History in Jena, Germany, and lead author of the study. "First of all, there's still a strong surviving Native American component, despite all the admixture with European genes ever since the Spanish conquest. What's more, here the native component is quite different from the main genetic network in the highlands of central and southern Peru. This is where the Inca Empire and its predecessors originated, and their conquests, road networks and empire-building ended up homogenizing the genetic make-up here." The current study reveals how the people of Chachapoyas, by contrast, remained relatively isolated. "So it seems that some genetic legacy of the Chachapoyas did indeed resist Inca impacts, all the way through to today," explains Barbieri. Two Peruvian geneticists, José Sandoval and Ricardo Fujita of the Universidad San Martin de Porres in Lima, Peru, also took part in the study. "These latest samples are part of a wider genetic coverage of Peru that we've been building up for years. It's these groups like the Chachapoya, culturally and linguistically highly distinctive, who have the most to tell us about our ancestors: where they came from, where they migrated to, what interactions they had with each other, and so on. 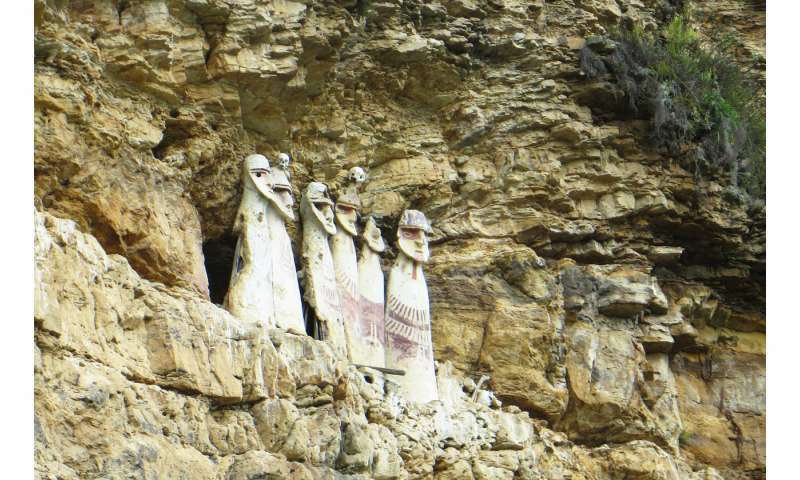 Also, the Chachapoyas culture left such extensive archaeological remains that there are good prospects for recovering ancient DNA, to complement the modern picture." Paul Heggarty, a linguist and senior author of the study, also of the Max Planck Institute for the Science of Human History, was first motivated to launch this project after unexpected results from a linguistic fieldwork trip to Chachapoyas. He was able to find a few remaining elderly speakers of an indigenous language that most assumed was already extinct in this region. "Quechua is one of our most direct living links to the people of the New World before Columbus. It still has millions of speakers, more than any other language family of the Americas - but not in Chachapoyas anymore. There are only a dozen or so fluent speakers now, in a few remote villages, so we need to act fast if we're to work out its real origins here." The Chachapoyas form of Quechua has usually been classified as most closely related to the Quechua spoken in Ecuador, but the new DNA results show no close connections between the Quechua-speakers in these two areas. "Linguists need to rethink their traditional view of the family tree of Quechua languages, and the history of how they spread through the Andes," notes Heggarty. "It seems that Quechua reached Chachapoyas without any big movement of people. This also doesn't fit with the idea that the Incas forced out the Chachapoyas population wholesale." Jairo Valqui, another linguist co-author from the National University of San Marcos in Lima, adds a further perspective on an even earlier language layer. "Once Quechua and Spanish arrived, the local Chachapoyas languages died out. Recovering anything from them is a real puzzle and a challenge for linguists. They left very few traces, but there are some characteristic combinations of sounds, for example, that still survive in people's surnames and in local placenames, like Kuelap itself." Valqui, himself a Chachapoyano, also makes a point of taking these genetic results back to the local population. "For Peruvian society today, this matters. There's long been an appreciation of the Incas, but often at the cost of sidelining everything else in the archaeological record across Peru, and the diversity in our linguistic and genetic heritage too. As these latest findings remind us: Peru is not just Machu Picchu, and its indigenous people were not just the Incas."